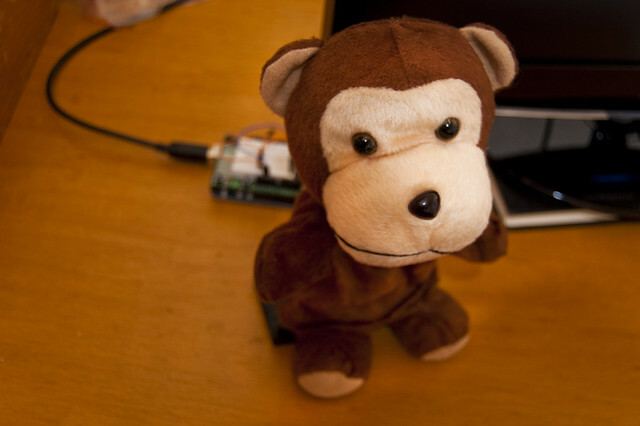 A bit of light hacking to build a small wooden stand, mount two servos, and place a monkey hand puppet on it resulted in the Twitter Monkey. I debuted the Twitter Monkey at the November 2010 Web414 Meeting, and instructed people that as they posted on Twitter and included the hash tag #web414, the Twitter Monkey would get excited and wave it’s arms up and down. We saw a lot of hash tags that night! Note: The “Twitter Monkey” is sometimes referred to as the “2XL Monkey” (especially on Twitter) since it’s frowned upon to use “Twitter” in the name of things.